Hey guys! On Tuesday we discussed how to use Instagram to share your writing and reach a bigger audience. Well, to keep up with the social media theme, I thought today we could talk about a different and very important social media outlet: Twitter! If you don't already have a Twitter for writing, I highly suggest creating one. I used to not be a big Twitter fan simply because I didn't fully understand what an amazing place Twitter could be. But after attending my first writing conference last year, I quickly learned how beneficial this little site can be. In on of the classes I took, the speaker stressed over and over that Twitter is a huge, amazing network for writers and that every aspiring author should have one. At the time, I already had made a Twitter specifically for my blog. It was originally just going to be a place where I shared my blog post and followed other writers. But, soon enough I switched it to my name and began promoting not just my blog, but my writing as well--along with connecting with other writers! Still not convinced Twitter is that great? 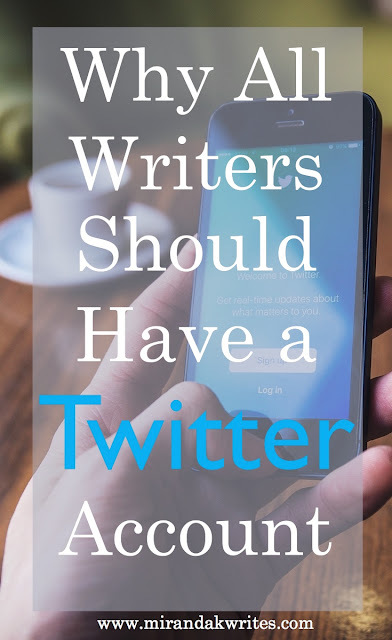 Here are four reasons why every writer should have a Twitter account. 1. Twitter is a place to connect. This may seem a little obvious, but let's be real--there are thousands of people to connect with on Twitter. Thousands of fandoms, thousands of brands, thousands of messages--which means that nestled within the giant Twitter nest is the writing community! From new writers to old writers to bestselling authors to literary agents and publishing houses, Twitter is home to a giant community of writers. You can meet writers far away, nearby, writers who write what you write, and writers who don't. The possibilities are endless! Not only can you connect with other writers, but readers, as well. Your readers. Twitter is an awesome place for your audience to connect with and talk to you, which helps you become a better, stronger brand! When you make connections, you build your platform--and we all know how important it is to build a platform. 2. Twitter is a place to share. Like I said in Tuesday's Instagram post, I've never been very good with hashtags simply because I never really understood them. But on Twitter, hashtags are awesome because #1 they connect your to a wider audience and #2 they help you share your work through fun games! There are tons of hashtag games different writers have begun and host every month and every day. For example, #AuthorConfession is a month-long series of daily questions that the creators, J.M. Sullivan and Jessica Julien post for authors to answer. It's super fun and let's you connect with so many other writers! There are also tons of opportunies every year to pitch your book to agents through Twitter hashtags! #PitchWars and #PitMad are two popular ones. Though I've never participated myself, I've seen dozens of writers get query requests from agents based on their #PitMad tweet. If this sounds like something you'd be interest in, HURRY--#PitMad is TODAY! If you're interested, here are a list of my favorite hashtag games to participate in on Twitter! 3. Twitter is a place to promote. Now that you know how fun hashtags can be, you should also know how important they are when promoting your work! Twitter is a great place to promote--whether it be your book, your blog, your poetry, your art--whatever. Posting links to Twitter can be super beneficial thanks to hashtags, likes, and retweets. These tools allow your work to reach greater audiences--because even if you only have a few followers, someone with a ton of followers may come along and retweet your tweet--and boom! Suddenly a bunch of people you couldn't reach before have been reached. Twitter also offers campaigns for advertisements, which is super nice if you want to make an ad for your book or something. Because Twitter is just a big community, you'll never be alone when promoting. And if you share and promote other writers, they just might share and promote you back! 4. Twitter is a place to learn. There are sooo many different kinds of writers on Twitter! New writers, published writers, writers with degrees, literary agents, publishing houses--it's crazy, and amazing. The writing community is a great place to ask questions and voice your opinion because there are so many people with so many different thoughts and ideas. Don't know anything about surfing? Ask your writer friends who live in California and surf. Need to know how to translate a word into another language? Tweet it--someone who speaks that language might help you! Obviously, every website has it's faults, and Twitter is not exempt. There will always be trolls, bullies, and people who are just downright rude. But when you look past that and focus on the good, you'll find Twitter to be a super helpful place where you can share, grow, and learn as a writer. What do you think? Do you have a Twitter for writing? Comment below! And if you would like to give my Twitter a follow, you can check it out here! I'm only 12 away from 500 followers, so your help is appreciated! I loved reading this! I'm still trying to figure out Twitter for myself - I find it hard to connect with other writers and bloggers for some reason. The hashtags look like a good place to start though, so perhaps I'll try working on that first. Thanks for sharing your wisdom! The hashtags are suuuper fun and a great way to meet other writers! My absolute favorite is Thursday aesthetic. This week (thurs, June 14) the theme is black and white :) Thanks for reading!